Submitted by Shadooow on 2013-11-16 10:10. Note: the 1.70 version is not required for 1.71, you can install 1.71 directly onto 1.69, it contains all 1.70 content and features. Got a question? If your question is not answered in the FAQ section in the documentation, feel free to ask on CPP forums or in a thread about community patch on bioware NWN forums. If you downloaded and installed patch with a manual version and you want to change your language translation, you don't need to download full package again, but only the translation file and replace it in your NWN folder. - all 2DA files from patch filtered/sorted by a three categories (full source, patch only and hak only). - all modified spellscripts and other scripts such as diseases, poisons, traps, feats and includes, sorted by folders. NEW: NWNPatch172_EN_RC5.7z - Patch 1.72 pre-release (english). Ongoing development, not recommended for PWs since this wasn't heavily tested yet. Adds many more fixes and plenty new features, also few client improvements such as additional colored GUI icons. Readme inside package or here. Then there is 1.71 tileset fixes package. Due to the space constraints, this package wasn't included in installer nor manual distribution. And only a very small group of peoples will use this package anyway. This package is intented specifically for the custom content builders working with tilesets. Package contains an ascii version of all tileset models modified in patch + the modified information files (SET/edge.2da). NWNCX_Patch - this file is included in both 1.71 installer and manual distribution, the reason why is the file separately here is for a peoples who want to stick with vanilla or patch 1.70, yet they want to try this plugin for NWNCX. NEW: there is a new version inside the Patch 1.72 beta offering new fixes and features. CEP 2.4 2DA merged 1.71 / 1.70 - All conflicting 2DA files from CEP 2.4 updated with all patch features. Intented mainly for the module builder's. Players don't need this that much. This is not a panacea though since CEP is a client content, players downloading official version with default 2DA files so you can't rely on this and they might not see the new features even if you add them. As an example, if you are a builder and you use these merged 2DAs you will be able to select a new itemproperty from patch in toolset - Wounding (negative regeneration). However, player will not have these merged 2DAs and if he finds your item he won't see this property in the item description at all! Hopefully the new CEP2 version will support 1.71 officially so everything will work fine. Translation reference - text file with a detailed changes done to dialog.tlk file and instructions for a translators. Your language is not supported yet? Grab this file and help with that! Uninstall - In case you want to uninstall community patch from your game, you can either use the 1.69 critical rebuild or download this file and unpack it in the NWN folder (allow overwriting). Note you don't need to uninstall 1.70 before installing 1.71! So, just to confirm, that Auto 2DA Merger would do all the work necessary for CEP/Project Q compatbility? Or are there additional steps that need to be taken by the user manually? This looks interesting, but I don't even know where to begin on actually fiddling with NWN (Much prefer playing :P) and wanted to double-check. Thanks! also, the result of the process is quite hard to read for human (all spaces replaced by single space) so its very recommended to open and resave each of the processed 2DAs by some 2DA editor. In short. If you are not an experienced user you should not care about 2DA/script merging. Thats not even a player's responsibility but a module builders' or CC packages creators' - you just have to push them to it ;). Bodaks appear with a horse atop, so you should probably fix it. And make new classes optional, please. They conflict with other class-mods. I assume you are using 1.72 beta? That would explain bodaks. I will look into into it. and get your character bugged. They are optional in the way that you don't need to take them, and if you won't then there wont be any compatibilty problems. They had to be there because any custom content reusing the same lines is bugged and gets features of these hidden classes which are hardcoded. Older module-related it wont fix anything sure, but I hope future builders avoid reusing these lines. That's right. Thanks for your detailed explanation. Looking forward to next updates. this was reported long time ago and this is fixed in latest 1.72 beta, however the bug was in vanilla blueprint and I fixed that vanilla blueprint, but any copies made of that blueprint will have tails assigned and since thats a custom content there is no way to fix that. If thats the case you have to fix your own blueprint copy manually - open blueprint properties go into appearance and select tail = none. I just realized I never voted. This has become an essential for me - thanks for continuing to update it. I have probably voted long time ago, but here we go again. I had updated to patch 1.72b14 and freaked out due to all the work I'd put into my module using this patch. I checked and there is no check for the version beyond 1.69 and everything seems compatible, so no prompt for a newer version than the player has, should they have Bioware's vanilla 1.69. Just so people know, you can upgrade and all of your modules will be fine for players with 1.69. That's a lot of work & I applaud your hard effort for the community, BRAVO! Or simply - how to open the inventory? "PC Widget Tool" - what is it? This feature is not automatic but optional and it has to be turned on first. Here is explained how to spawn and use PC Widget Tool if you have further quzestions PM me. and so the inscription is no break. As the running line. There is some misunderstandement here. First off community patch does not take 10gigabytes on hdd, thats CEP2. Community Patch is barely of size 200mb. Second if the installer failed (which now happens on win10 as it was created before win10 came and uses librarier win10 no longer has by default) then you did not even installed it and there is nothing to backup. Third, revert to vanilla can be done via 1.69 critical rebuild or simply by replacing xp2patch.key with the one you can download on this page under uninstall (and installer makes backup of this file as well so you just need to delete xp2patch.key and rename the backup to it). No need to reinstall anything especially if it never installed in first place as you suggest. The auto2da merger in 1.71 had its issues and wasn't perfect, it was replaced n 1.72 by better tool from leo_x. Note you do not need to run this - thats additional feature for module builders, player doesn't need this at all. How to fix the issue with installer is explained in first topic in FAQ section linked from this project - posting link again ´here. Or you can install community patch manually by extracting files from archive - just download one of the manual versions and unpack it in NWN folder and confirm overwrite. I wanted to know if the new CEP 2.62 is compatible with your latest stable patch (1.71), or should we wait for the 1.72 patch? CPP is compatible with everything in a way that if there is conflict (ie. file used by CPP and CEP2.6) file from custom content is used (CEP2.6). This by itself should prevent any issues but obviously for a cost of losing some of the CPP fixes/functionalities. Problem is not on CPP part but on CEP - CEP is the one who should add CPP fixes into their 2das. not the other way around. Unfortunately I don't think that ever happens. I can't find instructions anywhere on how to add this to a module. Another question, what changes were made to baseitems.2da? Where can I find the nwnx_patch ini settings? The one from 1.71 has no settings unless you use linux version in which case the settings is deswcribed on the page you downloaded it. I noticed these bugs with the beta 15 version at least. - Taunt seems to cause the target to stop attacking (as if ClearAllActions was called on them). - Buying items from a store causes the item to not go to where it was dragged but to the first page in inventory. - Trying to mount a horse after casting "Divine Power" ends up not working. Apparently Divine Power applied an invalid effect on the player as it gets stuck in the "if (HorseGetIsDisabled()) return;" part of the HorseMount function. I suspect the EffectModifyAttacks is the culprit here since it even states that if nAttacks > 5, it is an invalid effect..but could be something else. I have used this patch for so long, this vote is way overdue. Is it possible to make it work CPP AI together on OHS Henchman System ? I can't imagine playing (and building) NWN without this patch anymore. It should be stated on GOG's Neverwinter Nights page in bolded letters that everyone should download it. Longer answer: It is a patch. It will automatically fix various bugs and issues. It will work as is with any module without doing anything else than installing it. However, since the patch takes lowest priority, if there are scripts in your modules that were changed in community patch, yours scripts will take priority. That ensures that you won't lose any functionality of your own (unlike when installing PRC/3.5rules), however that also means that unless you merge the script(s) with changes made in community patch, you might not take effect of the fixes/features/improvements made into this script(s). Similarly with 2da. If your module uses haks and has 2das in them, unless you merge 2das with changes made in community patch you might not take effect of the fixes made. So basically, if you want to take full effect of this unofficial patch (and that is optional - I repeat, it will work as is) then you need to do what you should do with NWN:EE -> merge changes in 2das into your 2das (NWN:EE made 2) and merge changes in scripts to your scripts (NWN:EE made none). Within the package there are resources for builders which will make this task easier, check it out. If you have further questions please write on community patch subforum in meantime I will try to prepare comprehesive tutorial for this task. After 1.72 rc2, will there be no more update for NWN1 Diamond edition? I experienced same bug as below link. "Once the game is saved and loaded with aura effects active they will be permanent regardless of duration or rest"
EDIT: My issue was resolved some time ago, it turned out to be user error. Make sure you're downloading the most recent version, folks! I have downloaded 3 times now the rc4 for nwn ee and all I get are files that say unsupported compression. I have 7zip and winrar neither one opens it right. What am I doing wrong? I just downloaded nwncx.0.2.9 from the vault and it worked fine. Having just downloaded this successfully I can only think that your versions of winrar and 7zip must be out of date. Current versions of WinRar, 7zip and PeaZip can be downloaded from those links. BTW AFAIK PeaZip handles certain historic compression methods of the zip file format that the other 2 don't. Thank you very much. I looked over the contents and didn't see a NWNX run file. How would I run a server with a module needing NWNX. such as shas subraces or sims chat command or higher ground legendary levels? How can I use the nwncx_patch and/or nwnx_patch for single player? 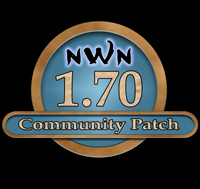 I don't undestand about Nwn modding, I only want to get the fixes done by 1.72 that are only avalable using the plugins. Also, if I donwnload the 1.72 patch, do I have to donwload the plugins too or it's all on the patch already? Hi, first of al, do you use NWN:EE ? If yes then those plugins are not a concern anymore as they don't work with EE (so far). - if you want to get those extra fixes then you need to download NWNCX package: http://www.neverwinternights.info/nwncx.htm and run game using it (use NWNCX_Loader to run nwn or alternatively patch your game using that patcher and then you just run nwmain.exe as always), if you install 1.72 then it comes with nwncx_patch.dll which you should have in NWN root directory, if so, running NWNCX_Loader will run this plugin with it. I hope this answered your questions, the stuff around NWNX plugins is confusing and might need better explanation or even rework, however thats the way it is now... If you have further questions, please post on forum, I will be able to reply faster.